The 6-cell ThinkPad Battery 70+ powers your device for the longest possible time. Compatible with the T410/20/30, T510/20/30, W510/20/30, L410/12/20/21/30, L510/12/20/30 systems, the average run time is 57 watt hours. 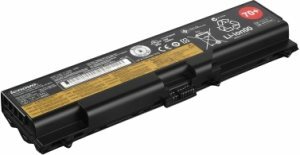 The rechargeable battery utilises Lithium-Ion technology and works with the ThinkPad External Battery Charger (40Y7625). *Battery life differs due to many factors, including: screen brightness, power management, features, battery conditioning, applications and other customer preferences.